China's manufacturing sector expanded at a fast pace in March as the country's economy continued to grow steadily, official data showed Saturday. The country's manufacturing purchasing managers' index (PMI) came in at 51.5 this month, the strongest level this year, according to the National Bureau of Statistics (NBS). A reading above 50 indicates expansion, while a reading below 50 reflects contraction. In February, China's manufacturing PMI stood at 50.3. The NBS data showed the non-manufacturing sector also accelerated the pace of growth as its PMI was 54.6 in March, up from 54.4 last month. The composite PMI, which combines the performance of both manufacturing and non-manufacturing sectors, went up to 54 this month from 52.9 in February. The rise in March PMI indicated more stable economic growth, as well as steady market demand, robust manufacturing and business activities, and good expectations, said Zhang Liqun, researcher with the State Council's Development Research Center. The pick-up in manufacturing expansion came as factories resumed production after the Spring Festival holiday, with sub-indices for production and new orders both rising to 53.1 and 53.3, respectively, according to NBS senior statistician Zhao Qinghe. Small enterprises witnessed a particularly strong increase in manufacturing activities, as the PMI for small manufacturers jumped to 50.1 in March from 44.8 last month, NBS data shows. Zhao also attributed the faster expansion to stronger foreign trade, better industrial structure, and increased business purchasing activities. Sectors like equipment, high-tech and consumer goods manufacturing recorded higher PMI than the overall manufacturing PMI level in March, indicating progress in bringing in new growth engines. For non-manufacturing industries, the service sector, which accounts for more than half of the country's GDP, reported healthy expansion with the business activity index standing at 53.6, well above the boom-bust line of 50, NBS data showed. Construction business picked up in March due to warmer weather and further progress in infrastructure construction. Its business activity index rose to 60.7 from 57.5 in February. Both service and construction firms remained positive on the market outlook in March as the business outlook index stayed above 60 this month, an optimistic range, for the 11th month in a row. 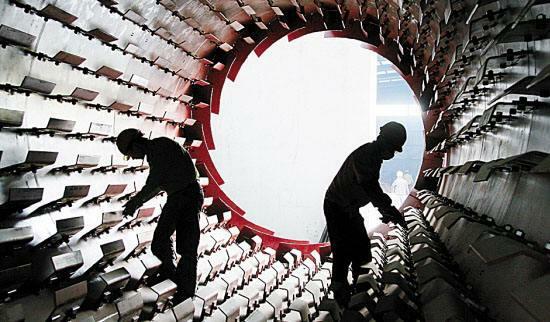 Beijing-based investment bank CICC said despite factors like an unfavorable working day effect from a late Chinese Lunar New Year, March manufacturing PMI came in "more resilient than expected," indicating relatively robust cyclical momentum in the first quarter. "Looking forward, we expect the industrial enterprise profitability to continue to improve and manufacturing investment growth to be on the mend throughout 2018," said the CICC in a research note. Chen Zhongtao, an analyst with China Logistics Information Center, said a good start in the first quarter will lay a solid foundation for future growth, who expects China's economic performance to remain sound and stable in the second quarter. The NBS is scheduled to release key economic data of China for the first quarter on April 17. China expects economic expansion to be around 6.5 percent this year, unchanged from 2017.